These truffles are made from the same recipe that is used for Salted Caramel-Bittersweet Chocolate Sauce. The combination of the flavors of salted caramel and bittersweet chocolate is one of my favorites. The salt brings out the best in both the caramel and the chocolate. These have a velvety texture and will melt in your mouth. Make the sauce and allow it to cool, then chill in the refrigerator at least 1 hour. Line a baking sheet with waxed or parchment paper. Place the cocoa powder in a small bowl. Use a 1-inch diameter ice-cream scoop to scoop out the truffles and place them onto the lined baking sheet. 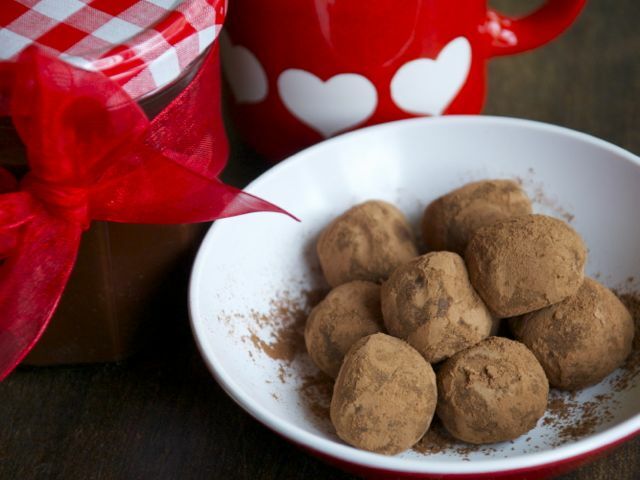 Roll the truffles into balls between your palms, then roll each ball in cocoa powder, coating them completely. Replace the truffles on the baking sheet. Serve them at room temperature in fluted paper candy cups. Store the truffles in an airtight plastic container between two layers of waxed paper in the refrigerator, away from strongly flavored foods, up to 2 weeks. To freeze up to 3 months, wrap the container tightly in several layers of plastic wrap and aluminum foil. Use a large piece of masking tape and an indelible marker to label and date the contents. If frozen, thaw overnight in the refrigerator and bring to room temperature before serving.